​Happy family, happy pup......happy endings! ​They were left at Lupita’s door step. They were tiny puppies that still needed a mom, but there was no mom in site. What would you do in this situation? Well, Lupita took a few days off of work, so she could bottle feed them every couple of hours and give them a chance at life. Their condition was fragile, and she did all she could to keep them safe. They were being quarantined from the other dogs in the home as a precaution until one day when Lupita left her bedroom door open by accident. When she returned the little pups were gone. She found them shortly thereafter cuddled in a ball and sleeping next to her dogs Jacob & Mantequilla. They had adopted the little fur balls and began helping in their process of healing. Moyo & Moka continued to improve and were finally able to be vaccinated & receive all the other care needed prior to adoption. Moyo is a happy male pup that is a bit shy and submissive. He loves playing with other dogs and does well with children. We are excited that Moyo has a wonderful family waiting to adopt him! ​He was found on the streets in terrible shape. It seems that someone had thrown him away after using him as a bait dog. We don’t know for certain, but from the number of bite wounds on his body, his gentle demeanor and his physical state (quite thin and reeking of infection), it isn’t a hard guess to make. 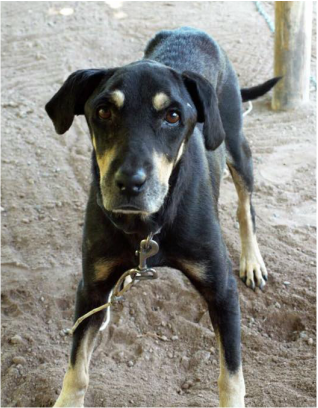 This poor dog had experienced the worst of humans and yet when Celia found him, he was gentle and grateful for help. Sultan remained at the vets for weeks in order to get the infections under control and his health back on track. Thankfully, he is now healthy enough to be in a foster home and boy is he enjoying his new lease on life. Sultan is somewhere between 6 to 8 years old. It isn’t easy to tell if his physical state is because he is older or if the conditions in which he lived simply took a toll. He now weighs approximately 18 kilos and continues to get healthier each day. We are simply amazed that Sultan is already leaving his past behind – when he was rescued, he was afraid of men and now he is friendly with them (guess it helps that he has met a number of wonderful men since being rescued). Sultan also does great with all the dogs in his foster home (both large and small) and seems to be fine with cats (he hasn’t been off leash around them but doesn’t seem to have any interest). If you are looking for a true golden oldie and have the time to love him, this could be your guy. He likes to go on walks, but enjoys pats and snuggles more. He would likely do well with other dogs in the home and children as well. He deserves much better than he has experienced and we’re hoping someone can give him a home where he can relax and be loved. Sultan got his name because he is older and majestic. Now we just need to find his palace. If you are interested in adopting Sultan, please complete an application at www.mexpup.com. ​Our hearts are broken as we lost Moko yesterday. It was an accident and it happened so quickly...now he is gone. He was the most loved dog and he loved his kids so much. Run free now sweet pup. You will be greatly missed. Sultan arrived in BC, Canada to the life that he always deserved. He loved his pack and his humans. Sultan often gets to work in the vineyards with his mom and it is some of their favorite time together...just the two of them enjoying life and living to the fullest. We simply couldn't be happier that this once discarded dog is now loved and valued.